The Start menu is a graphical menu that pops up after clicking the Start button on the Taskbar, or by pressing the Windows key. The Start menu provides an easy and fast access to programs, files, settings and more. It can contain folders (menus, submenus) and objects. These objects are usually shortcuts to programs or commands that open applications or windows containing objects or settings. You can browse in menus and submenus with mouse or arrow keys. When using mouse, just point the cursor over a menu and its content will be displayed. It is sometimes suitable (or even necessary) to click the chosen menu, its content is then displayed. By clicking some objects in the menus, an implicit action assigned to the appropriate object is executed (starting an application, opening a window, executing a command...). Windows XP comes with two types of Start menus. They differ in appearance and functions. 1. Start menu (Windows XP) - newly designed menu for faster access to programs and settings. The icons of My Computer, My Network Places and shortcuts to Documents has been moved from the Desktop to the Start menu. Two items are completely new here - Recently used programs and Pinned items list. Other items remain almost the same. I must confess that I first was not keen on using the two-column menu, but later I figured out that it really has some sort of attraction and can really easier users´ work. Additionally, you can customize the menu. 2. Classic Start menu (as in Windows 2000) - well-known simplified Start menu from Windows 2000, very similar to the Start menu in Windows 9x. Customizing the Start menu - right-click the Start menu and choose Properties - a dialog window will be displayed; here you can choose the look of the Start menu and other settings. You can also open these settings from Control Panels - Taskbar and Start menu. The "Customize..." button is used to set up advanced properties. There are two columns in the new Start menu - the first one mainly containing programs and the other one with most frequently used items. The first column contains: 1. name and icon of the currently logged in user. 2. the "pinned section" containing shortcuts to your Internet browser, mail client and related programs. 3. most frequently used programs that are added after each start of any application. Under this section you will see the All programs menu. On the new Start menu you will also find a command called Pin to Start menu which belongs to each program´s local menu. Programs added this way will appear in the Pinned items list. In the default setup, only the Internet browser and the mail client that have been chosen in the Start menu settings are here. In order to remove a program from the Start menu, right-click the program and choose Unpin from Start menu. This adding and removing can only be used for applications, but not for documents. Remove from This List you can also meet in the list of most frequently used programs or as the Remove option in the list of All programs. Its task is to remove items from the menu. Games - something for fun. Pinball, Solitaire, Minesweeper and others.. Accessories - System tools and support programs supplied with Windows. Startup - programs that are started up after you start Windows. Place here programs which shall be started after the system start up. Some programs do that automatically which can cause a slowdown of the system start. Content of the All programs menu is saved into profiles of appropriate users. In your computer, it will probably be in folders: %SYSTEMDRIVE%Documents and Settings\%USERNAME%\Start menu. Shortcuts of particular users are stored here. Icons that are listed in the menu and you will not find them here, you will certainly find in the All Users profile directory. Getting quick access to the All User folder in the local menu of the Start button. If you also want the other profiles to be easily accessible, choose the Explore option. In this part of the panel, there are icons that originally were placed on the desktop and shortcuts to objects from Documents. This command displays the Documents folder as menu. (the Display as link command is described later in this article). For shortcuts that were originally placed on the desktop, you can - in the local menu - set up the activation or deactivation of their presence on the desktop. The Documents folder is displayed as a link. After clicking on it, a new window with documents will be displayed. 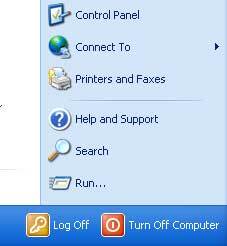 The Control Panel, Administrative Tools, Connect, Printers and Faxes options provide the access to basic configuration tools of the computer. Help and Support - displays a windows containing detailed help for system configuration. A new interesting feature is here - ask for help. You can upgrade your system from the Internet, display compatible software and hardware, or use advanced diagnostics for getting a detailed overview of your computer. Search - displays the search-for window. Here you can enter what you are looking for - a file or another object contained in your computer, your network or Internet. If you want to set up the style of the menu, choose the Customize button. In the opened dialog window you can set up the look and the content of the menu. Open submenus when I pause on them with my mouse - after you point the mouse cursor over a menu, its options will be automatically displayed. If you deactivate this checkbox, you will always have to click on the menu . Highlight newly installed programs - newly installed programs will be highlighted in the menu. Start menu items - particular items can be displayed as a menu or a link (details were described in the "Documents and icons from the desktop" section). The activation of Administrative Tools is probably the most often used. Other items and their presence on the Start menu is only up to you. List my most recently opened documents - activates or deactivates the My Recent Documents folder on the Start menu. Well-known simplified Start menu from Windows 2000, similar to the Start menu in Windows 9x. 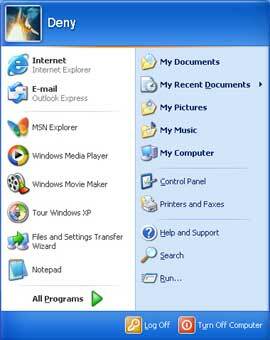 Unlike the Start menu from Windows XP, this classic menu does not contain icons from desktop, most frequently used programs, its configuration is easier and all items are arranged in one column. Add... - starts a wizard which will guide you through the shortcut creation. You can add a shortcut to a program, document or any other file. After you choose an object, just enter the destination in the tree structure and the name for the shortcut. Remove.. - opens a dialog window where you can select files or folders to be removed. Advanced - opens the Start menu in the Explorer. You can then arrange it as you usually do with files and folders in the Explorer. Administrators can organize the menu for other users, all users and adjust profiles of particular users. As it is located in the tree structure, so the shortcut will be placed to the menu. Advanced Start menu options - for each item you will get a detailed description after clicking the Help button and after clicking on the desired item. Displaying Administrative Tools and turning off individual menus are the most often used (Displaying all items from Start menu and Office 2000). By selecting the pop-up display style for folders you will get a direct and faster access to particular objects (Items will be displayed in submenus and no new windows will appear - there is a similar setup in the Windows XP menu - you can display it as link or menu). This option is available for both menu styles. Standard listing of items by letter or by date is not always convenient. By gripping - by help of the left button - and dragging you can arrange items as you like. You can also use this function between particular menus in the tree structure of the main menu of all programs. The future position of the dragged item is indicated by the horizontal line. The horizontal line indicates future position of the item. The dragging works in both directions, also between the Start menu and desktop and objects in the Explorer. In order to place a shortcut from the menu onto the desktop, grip the shortcut on the Start menu and holding the button pressed move until you reach the desired place and release the button. By deleting an item from the menu you will only remove the shortcut representing the appropriate application or document. Your data forming the application or document will not be lost! As for any objects on the desktop or in the Explorer, you can also for the objects in the Start menu open the local menu and remove, copy, cut or paste them onto the desktop, to the Explorer or to some other menu. Similarly you can use the Drag and Drop function.